My new destination now on day 5 of the 9 day trip was about 1.7 miles distant across what I expected would be easy to navigate cross country landscapes. The lodgepole pine forest was dense enough that I could not see too far ahead but it was easy to maintain a reasonably consistent direction without bothering to get out my compass since the distance was minor. 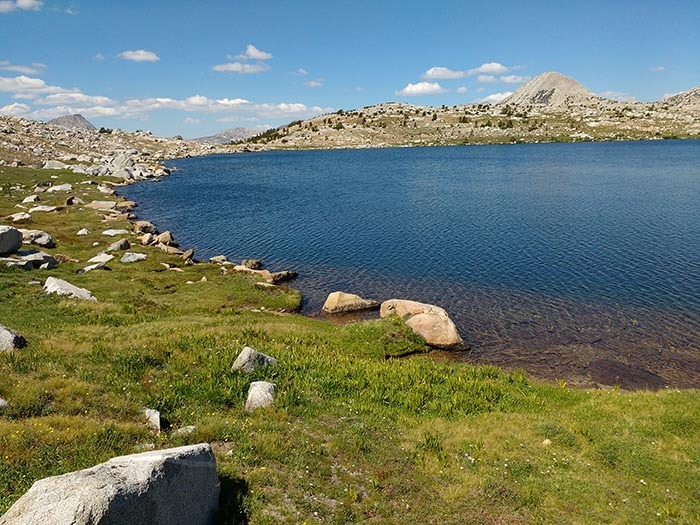 I hiked due north and after passing the lowest pond on the east side chain, turned northeast across a level bench at 10660 then traversed down a bit reaching Piute Creek at about 10580 where I dropped a bit more to an area of cascades. 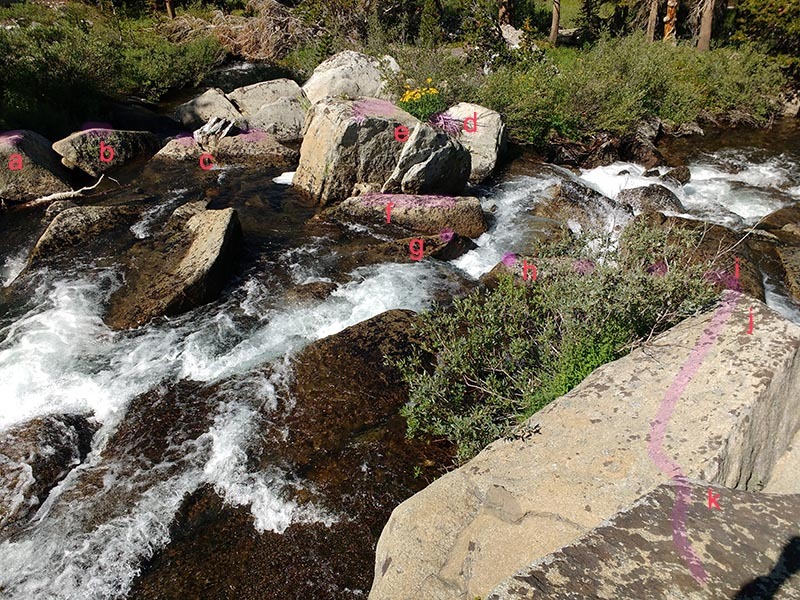 What challenging fun are more difficult boulder hopping stream crossings! I could have forded the stream at a few locations but to do so would require taking off boots and pants then attaching them up on my pack, taking off my big tripod for support crossing since I don't carry hiking poles, enduring bare feet possibly smashing against stream bottom stones, then drying off, putting boots and pants back on etc. Much better and faster for this person is to carefully figure out a way across without getting in the water while knowing one's limits and then perform the gymnastics to successfully cross. Of course doing so carrying a heavy backpacking load is considerably more hazardous than without. Per image at left, from the shore frame left out of view, I dynamically stepped across the tops of boulders a and b onto the left end of c where I stabilized stopping a moment. Then quickly stepped further right along c and out of this view onto some debris at d. From there put a knee onto boulder e to get onto the top with a hand push up. Sat down at the edge and eased down on boulder f that was amidst stronger stream flows. From this perspective one cannot see a water gap of about a 12 inches between e and f and about 18 inches between f and g. The gap between g and h was about 24 inches. Falling at this point would have had me flailing down in strong flows between awkward boulders. Not likely injurious or dangerous but certain to soak my gear. The crux was the step onto g that presented an awkward acute angle edge. Moving across moderate talus, I do that kind of dynamic stepping frequently but in this case the water added psychological fear. I would need to have enough momentum rocking forward in my dynamic stepping movement across the gap to then stretch my step to safety at boulder h. Hmmm...I looked at this for about a minute much like I do when during winter skiing a tricky sequence of short turns down some steep narrow section between obstacles. The main worry was that upon stepping onto the edge on g, I would lose balance and to negate that one needs to move confidently dynamically. Well it went well and I continued over to a wet slab under a shallow flow of water my Gortex boots thrive in at i then put a knee onto the big block j and with a hand push off atop of that rock lurched up then stepped up to this location at block k. Oh yeah, was the kind of adventure many of us thrive on! Note I am always wearing cheap foam knee pads that make that kind of monkey knee climbing natural. It was now 10:30am as I began a 650 foot climb up moderate gradients through open lodgepole pine slopes with dry brown grasses to the 11220 foot saddle south of Tomahawk Lake. I crossed the first map trail then another up and up, stopping regularly for 30 and 60 second or so breathers. At 11:25am I stopped near the top to take informational shots in all directions with my moto g. As I had neared the ridge top, vegetation had greened up with numbers of wildflowers about. During the trip had been careful not to power the cellphone on much and whenever done with whatever would power it off. I also carried a 6.4 ounce 6000ma/hour lithium ion USB port battery that includes a 3 LED flashlight and hand warming function that I use to recharge my cell phone and SanDisk Sansa Clip+ MP3 player. Soon I was crossing the saddle and at 11:40am was down at the lake edge at 11145 feet. Cellphone image at left is looking west along Tomahawk's south shore. Image at below right is looking north along Tomahawk's east shore. Skies were a saturated deep blue with light breezes giving the lake wonderfully bright blue waters. Shores of rock and turf mixed with vibrant green turf meadows with flowers. 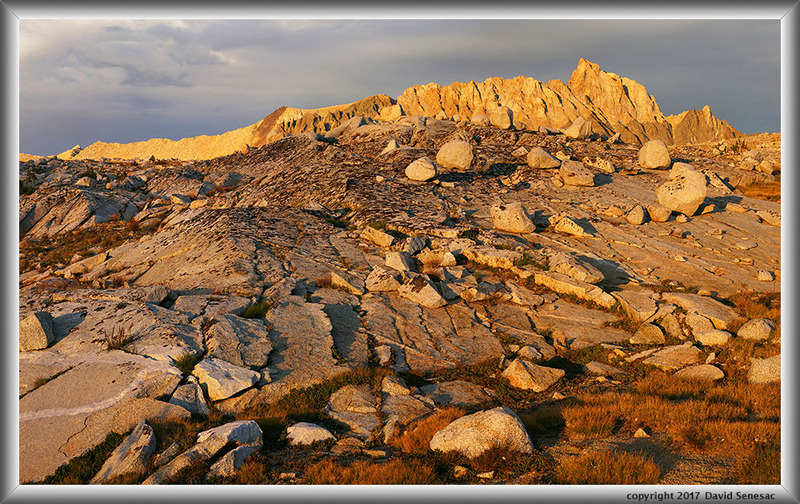 A quality of landscape and light that backpackers of timberline elevations greatly cherish. It looked so fine that I began to remove my photo daypack but then considered I would be at the lake at least a couple days, maybe 3 and these lake landscapes would certainly look even better at 9am on a sunny blue day. So continued on around the east shores while noting brook trout taking insects on the waters, now more interested in finding my base camp site, making camp, then eating lunch. Ahh but with sadness days later, I would not experience this wonderful weather and light again! 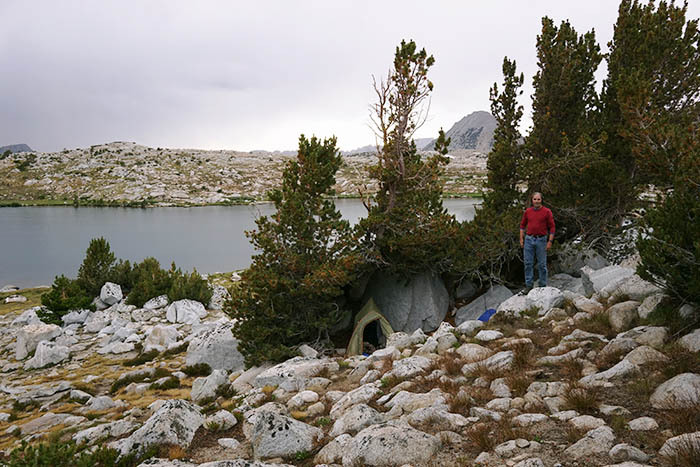 After dropping my backpack at the small bay along the northeast shore, I then spent over an hour rambling up and down and around slopes looking for the best location to base camp at settling on a well shaded and wind protected spot below whitebark pines. The lake would have to do as my water supply because it drains a tiny local basin that had already mostly melted out leaving just trickles still flowing in. Before the trip had decided not to bother lugging my water filter since I expected snow melt to be abundant, thus over 3 days filled water containers directly from the lake, something I will do if seasonal streamlets are not available. And note after decades have never come down with giardia. 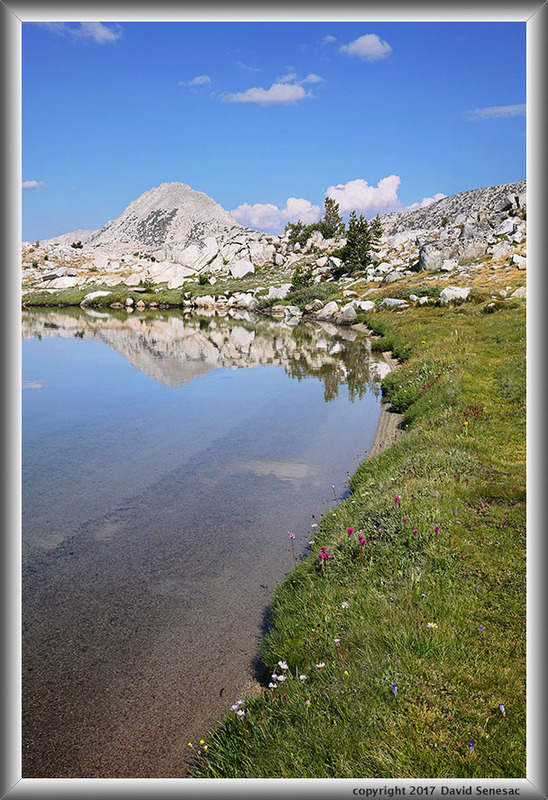 For lunch cooked a delicious Mountain House lasagna with meat sauce meal then went down to the sunny lake edge, jumped in, and laid about on a warm bright white slab of granite. Back at camp relaxed and took care of gear issues. About 4pm was off with camera gear on my afternoon day hike expecting to return to Tomahawk Lake a bit later. A few cumulus buildups were dotting the sky but it was still mostly sunny. I surveyed the stream areas due north that drained from Mesa Lake noting there were not many camp spots thereabouts either despite numbers of scrubby stunted whitebarks. 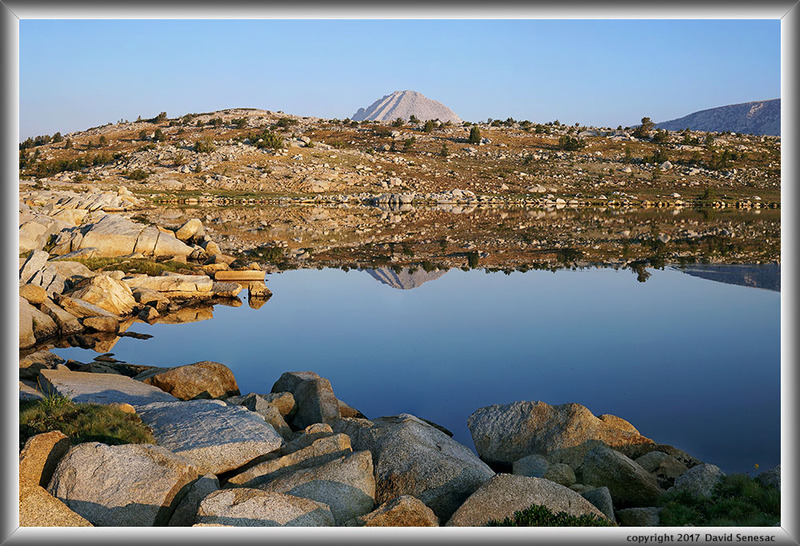 I climbed the modest slopes up to small Square Lake at 11300 in a modest barren basin that I would decline to photograph and then east over an easy saddle and down to barren expanses at fair sized Mesa Lake, at 11310 with unblocked views in 3 directions. The west shores of Mesa still had considerable water flowing down from snow fields on the ridge west creating very wet soggy turf meadows with many small pools. And the turf had large numbers of alpine aster with some shooting stars that I immediately went about looking to use for foregrounds. 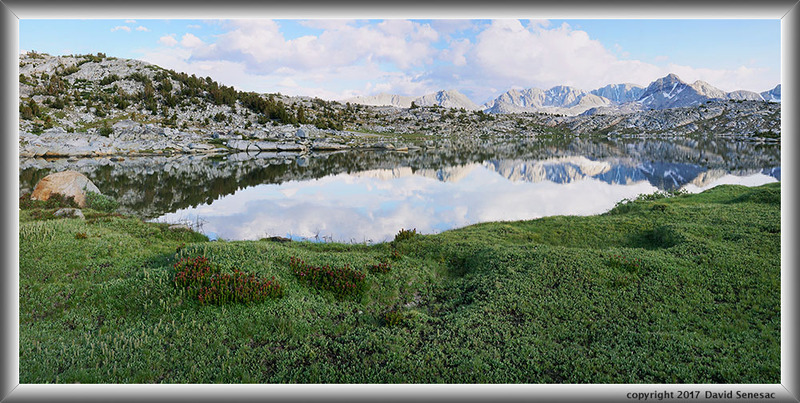 As I neared the lake a backpacker moving north on Roper's High Sierra Route also was passing along the shore so we stopped a bit to talk. He would soon be climbing up and over Carol Col then down into the lake bench in French Canyon. 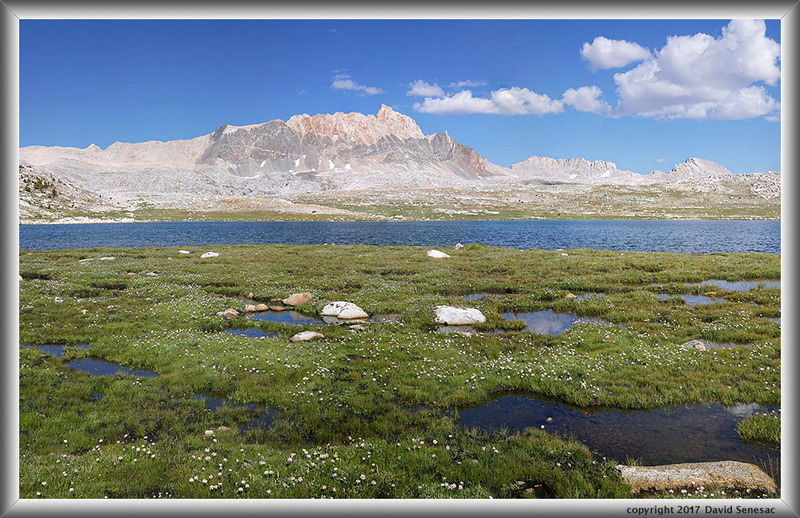 I first set up and captured the above 3 column wide stitch panorama of barren expanses and 13986 foot Mt Humphreys. 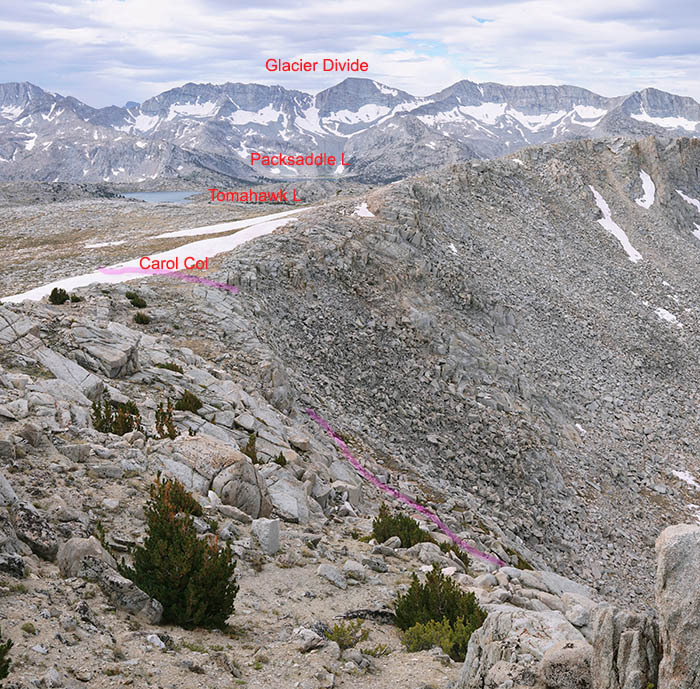 Note the darker metamorphic rock bands on Humphreys below its granite summit. Mt Emerson at 13118 is at frame right. By this time at 4:20pm wind had picked up making waters wavy and more clouds were rapidly growing in skies to the west above Pilot Knob. Next I moved a bit down the shore for the similar image of Mesa Lake at page top that also had an interesting boulder outcrop. Because I was considering camping at Mesa, I climbed up slopes north of the lake that held scattered whitebark pines and found a couple decent camp spots with some afternoon shade. The clouds to the west that had already been casting shadows on Tomahawk in the distance were soon also shadowing Mesa. At this time of late summer, dwarf bilberry, vaccinium cespitosum, leaves turn red and purple however due to the wet winter and late snows, most of these short turf height plants were still green. However in exposed areas where snows had been shallow that melted out by usual dates, they were nicely red. 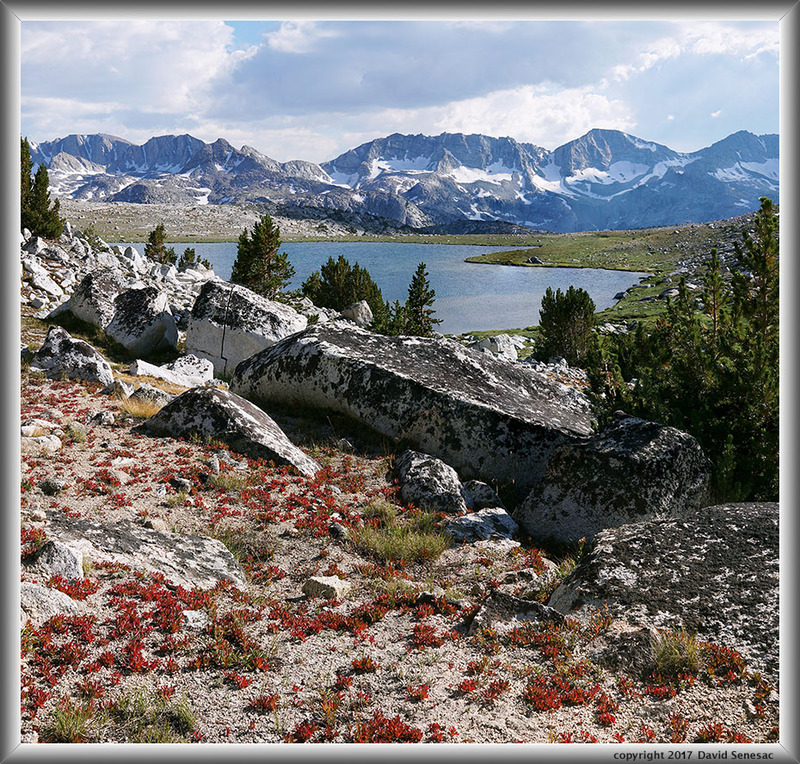 In the image above with Mesa Lake at mid frame and Glacier Divide in the background, where plants are growing sparsely atop bright white granite sand gravels, the red color is enhanced because of light reflecting up below the translucent leaves from the coarse sand. Note the growing clouds that would soon end photography this day. I was now so far out into the basin desolate areas, I might as well climb up east on the ridge so I could looked down at large Desolation Lake. Thus climbed up another 150 feet to the east and looked out across even more barren terrain, rather boring in the dim light. The miserable chilly wind just kept growing stronger as I hurried southwest on the ridgeline back towards Tomahawk. Near the top of the slope above my lake where the map showed a small body of water, I found it was a beautiful turf dammed flower pond with a view of Humphreys that I hoped to return to during more pleasant afternoon conditions. Back at camp with yet another hour of day to pass, readied gear for the night. Interestingly, clouds to the west began to dissipate and winds subsided so by dusk moved out with camera waiting for possible cloud light reflection on the lake waters that indeed did come through with the above decent shot with my wide angle 19mm as large numbers of eastern brook trout fed on bugs. This Saturday turned out to have pretty decent weather, one of just 2 days on my trip without rain. 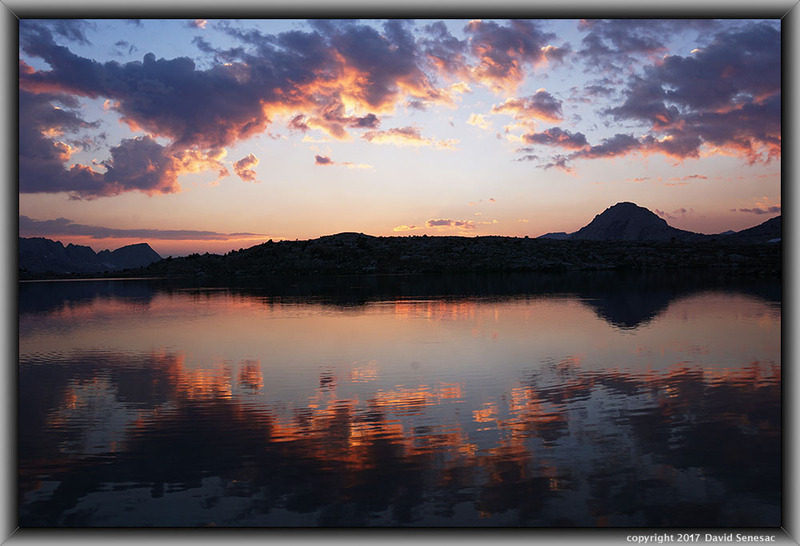 As dawn lightened skies on Sunday September 3, I was all too ready to get out of my tent and around the lake for reflections of the pink Earth shadow lowering in the west. After heating up water for a hot chocolate, I was on my way to the south shores of the nicely calm lake. But something was wrong as the sky brightened up enough that I could assess its quality. And yes I could most definitely smell a bit of what I saw...SMOKE. Oh how depressing this day's promise became in that moment. As warm light lowered down from peaks and then reached my shore position at 7:15am, smoke was not that noticeable at least towards the northwest so worked the above single frame image with Pilot Knob at center. Note the fish ring frame right at center and slightly dirty air at skyline left. 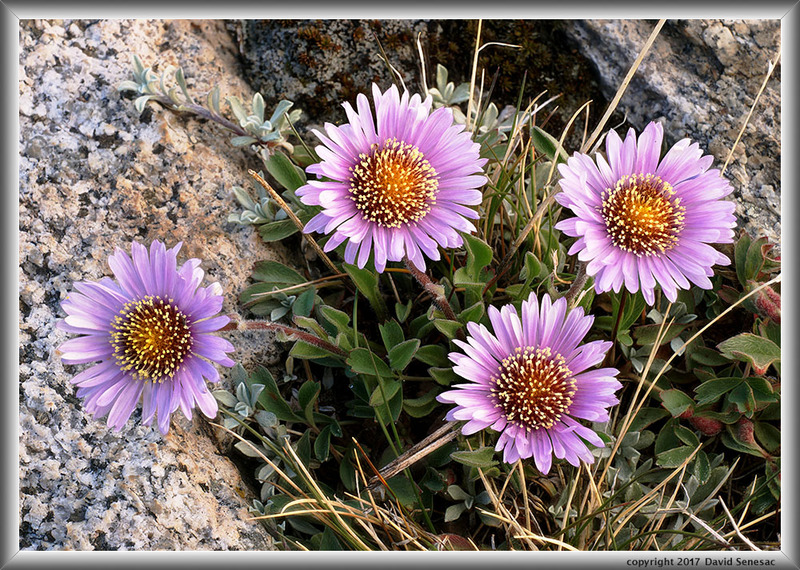 Down the rocky shoreline found a good specimen with image above of alpine aster that had nicely equidistant flowers for a vertical lens position, above normal saturation, and a near ground level below within focus stacking range. As the warm light waned, smoke in skies was more apparent so I abandoned further interest in landscapes, climbed the low gradient 11292 hill just west, then dropped into the green stream valley to the north that has a meadow at 10980. The image at right shows smoke haze against Mt Humphreys. After an hour I climbed back out of the meadow valley back to the shores of Tomahawk Lake. Skies to the north had least smoke and about 9:45am it cleared even more after a breeze came up offering nicely blue color so I managed to capture a rather respectable image along this beautiful turf and sand shoreline with Pilot Knob behind. However I really had hoped to shoot this with my 60mm lens as a large 2x3v stitch blend but that will just need to wait for a future visit. 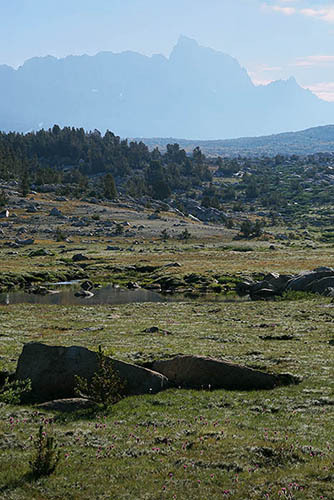 Most timberline Sierra Nevada Lakes have organic matter on their lake bottoms that tends to be brown or brownish green much of which is from algae. However for lakes exposed to frequent winds that have turfy edges where waves caused by such winds break on shores, there are often areas of clean bright granite sand. The waves pushing surface water against a shore, causes underwater currents below back away from shore edges into a lake that clears away organic debris from those edges since the debris has light weight leaving the heavier sand. The sand comes from the gravel sand deposits underneath the turf, a necessary component for soil in meadows. Sometimes winds will however blow floating debris like pollen and small pieces of wood across a lake onto such usually clean white sand shores that may sink browning up such sand until wind caused currents eventually clean sands up again. A couple reached the lake and began looking for a camp spot so I told them what I had seen. They ended up camping on the well used spot at the northeast peninsula. By later morning, a southeast breeze became stronger and clouds appeared ending any opportunity for landscape work. I decided to do some fishing, so began rigging up my gear. But was surprised to find the small plastic container that contains lures missing from my small fishing bag, a bag I had not bothered to check before the trip because I don't fish much anymore and vaguely thought everything was in the bag? Instead I would need to use dry flies with clear plastic floats that I am in any case very skilled at. By time I got out to the shore, blustery downdrafts were occurring that causes trout to not bother looking for surface flies because flies stay put down in vegetation when winds start blowing. Additionally the very wavy surface makes it difficult for trout to see insects on the surface. Well I moved to the one section on the southeast side of the lake most out of the wind where a couple fish were still feeding and landed a decent 10 inch brook trout I put on my stringer. But after an hour passed that was all as the wind made floating dry flies futile. So I let the traumatized trout free and went back up to my camp to cook lunch. Heck I had enough meals for 10 days so did not really need to catch fish but it bothered me that I'd decided at the trailhead to carry in the extra 2 pounds of fishing gear without making use out of it. After lunch although the morning smoke had left given the new southeast wind direction, it was increasingly looking like thunderstorm weather was returning after a couple day's absence. In the early afternoon I explored areas west of the lake for possible afternoon shots then returned to camp and went out again exploring areas above southeast and east. A strong thunderstorm blew in from the crest with lightning as I was up at the small pond above that had me retreating to camp whence it rained a bit with considerable wind before quickly blowing west weakening. It was now 6pm with areas of blue skies growing to the south and southwest. With earlier strong winds quieting, bugs came out so trout were once again actively feeding as can be seen in all the circles on the lake waters. Along the north outlet bay, I worked the above lush turf area looking south towards Glacier Divide. Note the catkins of arctic willow, salix arctica, rising up in the turf frame left. Several clumps of red mountain heather had already bloomed and gone to seed. Giving it a chance, I waited in chilly shadows on the west side of the lake for light to pop through the thinning clouds west but that was unproductive until 7:05pm when Mt Humphreys lit up briefly. Thus collected the above modest image with storm weather off east of the crest. As skies darkened, I didn't bother to wait the 15 minutes till sunset and instead headed back to camp, calling it a day. Monday September 4 would be the last full day I would have at Tomahawk Lake and by its wee hours I was not seeing many stars while wind picked up with temperatures dropping, an ominous sign. Daybreak began as the most blustery and chilly day of the trip with dark clouds rapidly flowing overhead from the east amid cold clear air and sunlight painting clouds here and there orange. By 9am the streaming clouds had decreased as I climbed up to the ridge southeast of the lake and then in a dispirited mood returned to camp wondering how to productively spend my morning. I might as well hike the 1.5 miles up 700 feet to Carol Col aka Puppet Pass I had wanted to do and take some informational shots down at the big lakes below since I was likely to lead a group backpack there the following summer. Thus back at camp for a pit stop, bundled up a bit more then hiked up the rib west of Mesa Lake keeping just east of the ridge top that was a good route with a use path obvious here and there all the way to austere turf meadows southeast of the pass. Those higher areas were increasingly arctic with snow, rock, turf, and cold streamlets making it all the more real in the chill blustery wind. A long snow field guarded the top south facing rim so climbed above part way up 12225 to set up my camera and take a set of shots of the Puppet Bench with its 10 lakes and then the route down the north side of the col. I expected more snow fields near the top of the north facing side, however the large snow fields were down atop talus along steep southern lake edges. First shot a 4 column wide angle stitch of the whole basin above (11500x6000 pixels). Note how the lakes with the ridge behind them at frame left are a darker color than those right with considerable wind waves reflecting the brighter cloudy sky. Next summer we will probably set up in trees near Paris to base camp 3 nights. I don't expect we will see any others way out there the whole time despite numbers of groups dropping down over the col because almost all just make their way to the exposed windy northeast end of Puppet to possibly camp but suspect many then change their minds after having traveled through miles of desolate barren landscapes, so drop down to trees at Moon or Elba where they can better get a whiff of horse apples haha. The above was shot from half way up the edge to 12225. The critical section just below top is visually blocked by a wall and vertical slots that is difficult to sense in this downsized version. This next image above was shot a bit west along the ridge brink from Carol Col. It still does not show the critical section below the col as that is also blocked by vertical slots in the bedrock. Such ridge line drops off vertical slots occur where blowing winter snow cornices falling over creating avalanche chutes. All 3 of the above images provide much better detail at full image size however none show the blocked tricky section that will need to wait till I drop down into next summer. 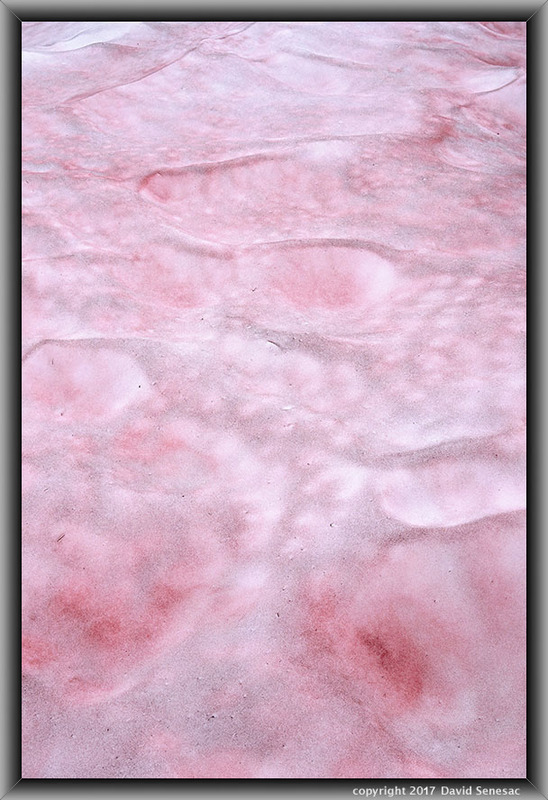 Watermelon snow, chlamydomonas nivalis, is a green unicellular algae with a red to pink hue that thrives atop summer snow fields. The red color helps filter out shorter dangerous ultraviolet light wavelengths. To the surprise of many, blooms of snow algae are often associated with an ecosystem including many species of protozoans, ciliates, rotifers, nematodes, snow worms and springtails. So we are all sometimes imbibing a bit of protein when drinking what appears to be clear, pure snow melt water. Thus when scooping up snow for drinking purposes, it is wise to dig down a bit below surface layers. The above strawberry Koolaide patch was the reddest spot I encountered during my trip. Most of the rest of my day did not involve photography though by habit always carry my valuable photo pack when leaving a camp spot for extended periods. Skies remained unpleasant though the strong winds subsided and at least mid day more blue skies poked through. I enjoyed rambling around the basin and discovered where the most Lobb's lupine were hiding that were near peak and over a sizable area. 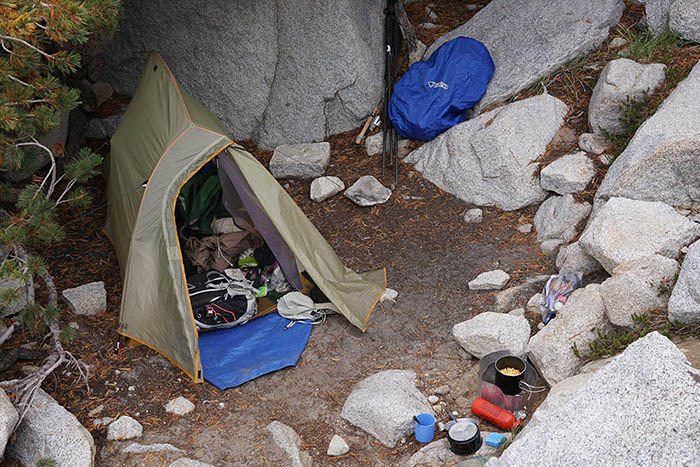 The couple that had camped on the north bay peninsula continued on over Carol Col while a solo backpacker Bill, sited in the zone at a camp closer to Mesa. Five minutes before sunset found me running around in meadows and bedrock north near the stream out of Mesa as light came under the cloud deck to the west illuminating slopes toward Mt Humphreys. Stronger storms had continued much of the afternoon at or east of the crest. A few minutes later when light would have been more red, the sun had already disappeared into clouds. My last chance for morning photography was Tuesday September 5, however by the wee hours weather was only more cloudy though without the blustery cold conditions of Monday. At daybreak showers were about making the notion of escaping a gamble and then about 9am a stronger thunderstorm arrived chasing me back into my tent. By late morning with clouds moving in from the south, that had moved off leaving breezy skies with at least some blue holes showing. 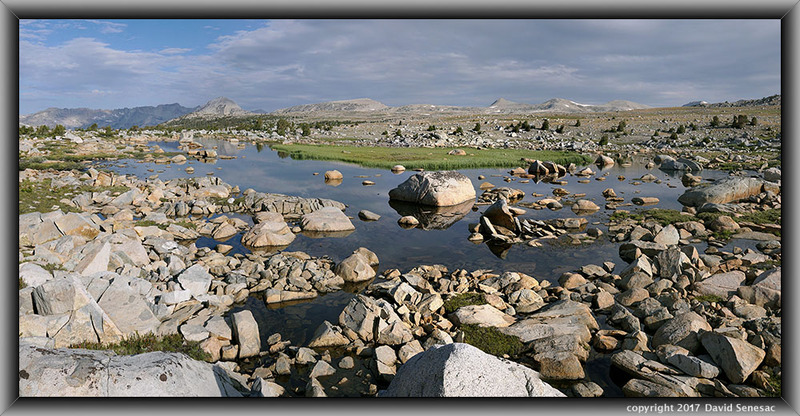 I needed to at least get closer to Piute Pass by day's end and preferably over Piute Pass and all the way back to the trailhead. So quickly packed up then got on the route by noon over the southeast saddle I had arrived through. Shortly saw neighbor Bill ahead of me doing likewise so yelled out a YO that got his attention then stopped. Skies looked like the better choice would be to hunker down west of the pass below tree line and my choice was to camp where I had near Grass Bullet Lake on my night 2. 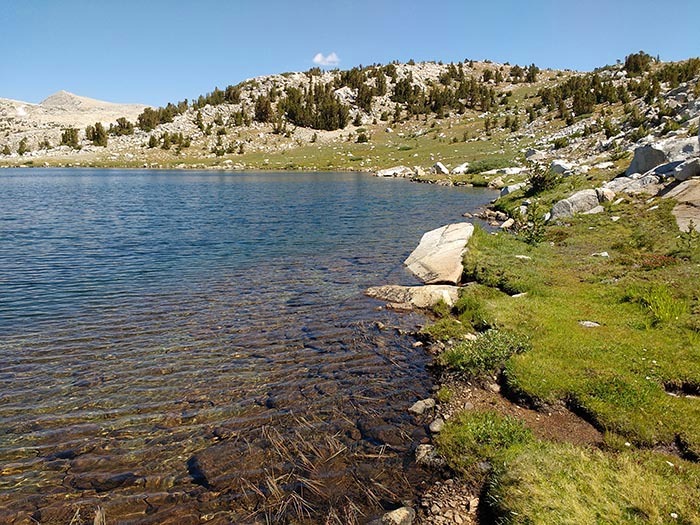 Bill wanted to go over Glacier Divide into Evolution Valley but after some advice given the weather, he later warmed to the more pleasant alternative of the Packsaddle Lake basin. As we passed the Desolation Lake stream, showers caught up with us so stopped and on went the pack rain cover. By early afternoon we were at the camp zone where he made camp about 100 yards from my position on the forested slopes. I spent most of the rest of the often shower threatening afternoon roaming about looking for close-up subjects and exploring the area more that I am likely to camp at next summer. The above image is of arctic willow, salix arctica. By the end of August during most summers, leaves begin changing to yellows and per above orange. As a willow, it is an actual tree despite its dwarf turf height as can be seen here noting the woody branch at frame right. One catkin is also visible. The species often grows in association with dwarf bilberry that has more rounded leaf ends than the pointy leaf ends of the willow and after leaf color change is more red to purple. However sometimes it is difficult to tell which plant one is looking at. After 5pm a lot more blue sky moved in from the southeast that allowed capturing the above 30mm lens 4 stitch blend image of the basin with Mt Humphreys at 13986 feet at frame right. 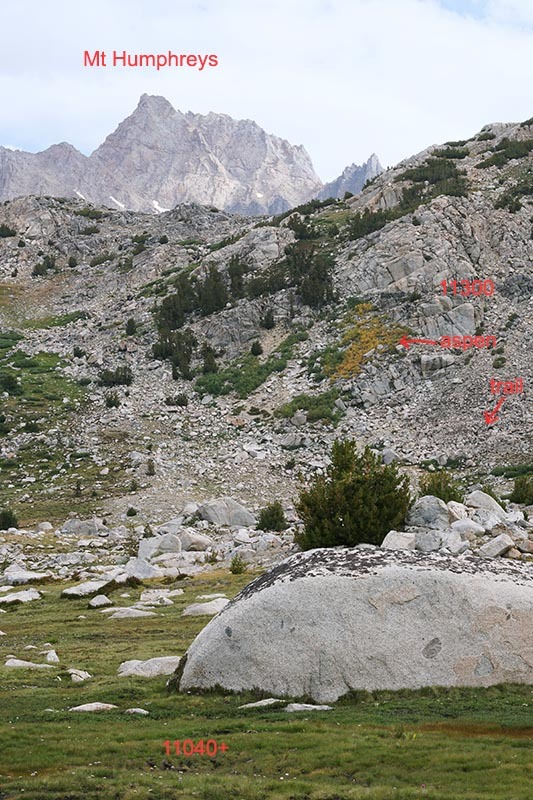 The triangular peak on the skyline frame mid left is 12225 just east of Carol Col. 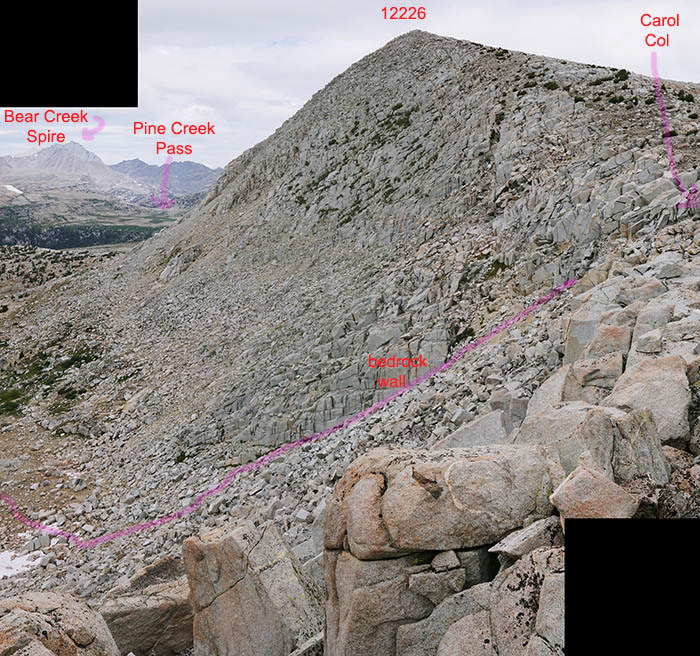 The large horse trail that follows down the south facing canyon side of Piute Creek from the pass routes across the base of the forested area below Humphreys then out across the plain. Three backpackers are visible moving east on the plain in the left slice of the enlarged vertical slice view. There is also an orange tent out in the distance, that is not visible in this detail limited downsized version. By later afternoon, the sun dipped behind clouds far to the west. Over 9 days of the trip, I had not experienced much good early or late warm light but then that is how weather often plays out and why one just needs to get out enough so that at least a few exceptional days are likely to occur. Light breezes and partly cloudy skies Wednesday September 6, greeted my last morning of the trip. Since I was at a productive location and weather did not at all look threatening, I would make the most of the time so after packing up gear and moving it down by Grass Bullseye Lake, spent the next 2 hours working the area. My first subject above was similar to that I shot the morning of day 3 though lower. Grass Bullseye Lake mid ground, Pilot Knob, and The Pinnacles in the background. By 10:00am I was done and moving up towards the pass. 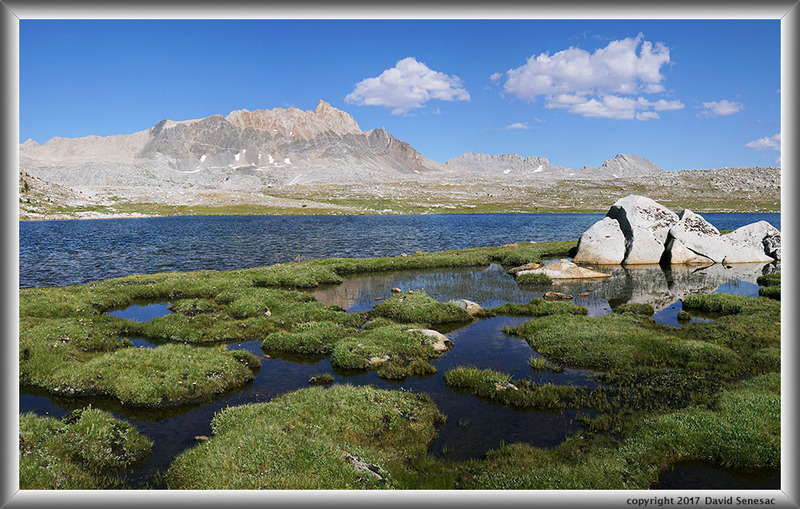 Above and south of Summit Lake, are some very lush green seep areas. 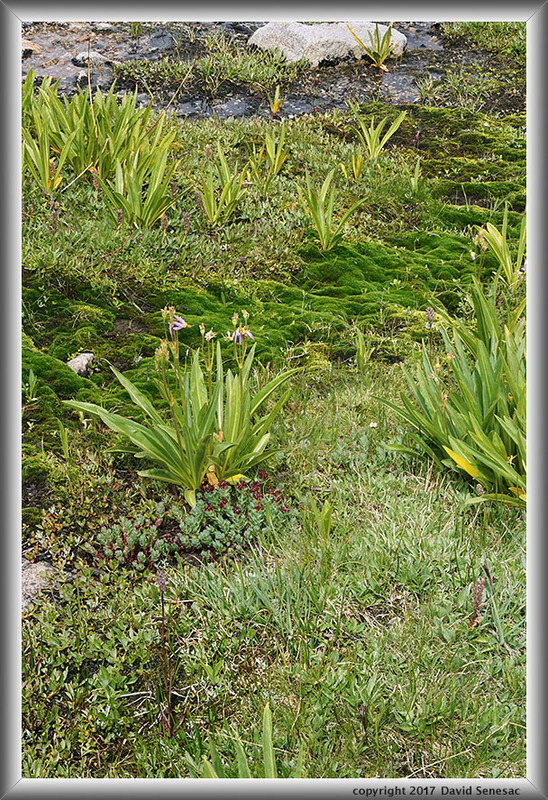 The above shows a turf complex of moss, lichen, arctic willow, grass, shooting star, roseroot, elephants head, and other herbs. Before reaching the pass I noticed a grove of quaking aspen high up in talus above the trail above Summit Lake per image at right. At 11300 feet, it is the highest elevation grove I have yet encountered in the Sierra Nevada and as its leaves had already changed to yellow, is the earliest color change I've yet seen for an aspen grove. 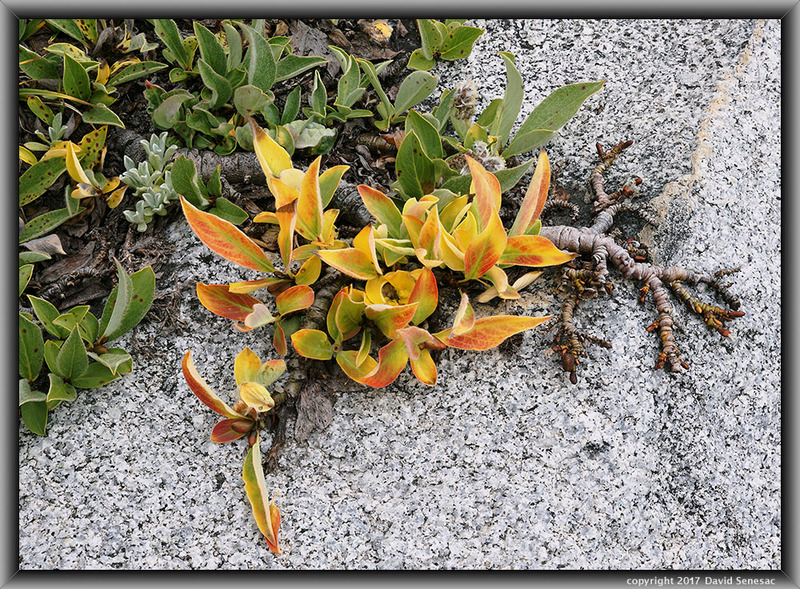 As I climbed up and over Piute Pass, I worked a few more close-ups. It was clouding up again as I passed Piute Lake and my first day's camp spot. By time I reached Loch Levin Lake showers started so on went my pack rain cover and rain tops once again. I had experienced at least some showers on 7 of 9 days during the trip. Though mid week, I passed fair numbers of groups coming up the trail. As I dropped down past the lake those showers ceased. Mountain pride penstemon and paintbrush were only now peaking there along the bedrock trail below a dome. What a late season for wildflowers 2017 has been! As I neared the trailhead, my feet were increasingly sore from the foot pounding so I had to stop every few minutes. Reaching the campground was a relief. As I turned onto the parking lot road by the pack station a stronger thunderstorm squall began raining moderately so I jogged along the final hundred yards or so, opened the door, and then tossed the whole thing inside the Forester, and got in. I could take care of the gear and the inside of my vehicle down the road beyond the storm. As I drove along the dirt road near North Lake, a young woman with drooping wet hair from Santa Cruz was standing in the pouring rain and as I approached stuck out a thumb for a ride so I stopped and she got in. This fine young woman had just impressively hiked solo out of Evolution areas over Lamarck Col so was quite beat, even more than I was but was excited about her grand experience especially all the wildflowers. Her new car was down at the Sabrina Campground area about a mile away. This last decade I've seen increasing numbers of women of all ages on our Sierra Nevada trails and that warms my heart because I can understand how the wall for them to overcome and participate in this rugged strenuous outdoor activity I love is considerably more difficult. It shows how much people love these places on our incredibly wonderful planet. It was already mid afternoon and I would be making a stop down in Bishop for food then driving north to Mono Lake areas to overnight. 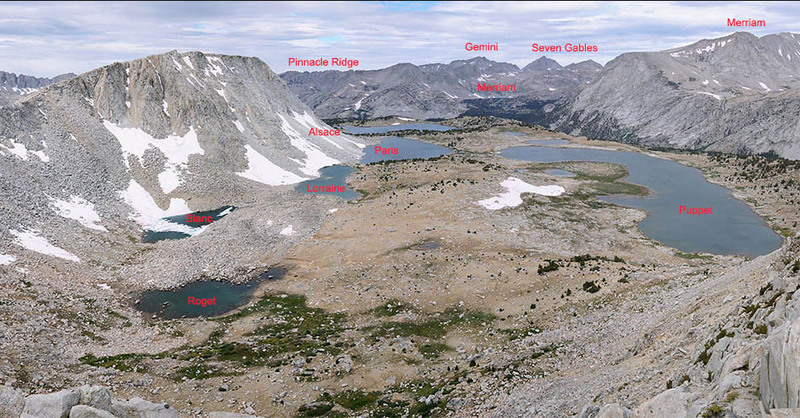 Thursday would spend all morning day hiking out of Saddlebag into 20 Lakes Basin before driving home in the afternoon. This was my fifth backpacking trip in 2017, 200th since 1971 after exiting the Viet Nam War duty from the United States Air Force, and is probably the last one for 2017, thus am now a single trip shy of an important milestone. Actually I had thought it was only my 199th trip until weeks later discovering a discrepancy in my trip logs.